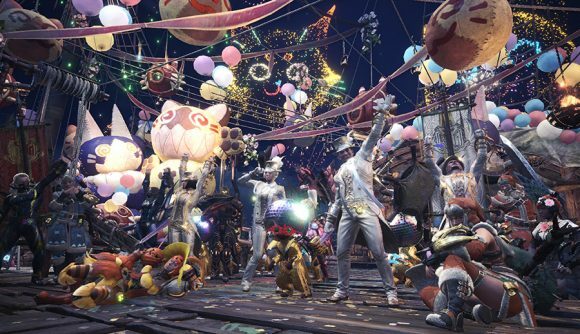 Monster Hunter: World is a year old now, and even though we didn’t see it appear on PC until August, we get to join in the Appreciation Festival event along with everyone else. That means a whole new selection of event quests and special gear to hunt for over the course of the festival, plus a chance to grab past limited-time offers that you may have missed. Astera’s Gathering Hub has once again been decked out for a party, this time with innumerable balloons. Staff have new glitzy uniforms, and the handler is temporarily dressed as a Palico. But what makes a Monster Hunter: World festival exciting isn’t the decorations or costumes, it’s the bonus gear that’s available during the event, right? During the first two weeks of the festival, which runs through February 22, you’ll be able to take on the limited-time quest The Greatest Jagras, which as the name implies has you hunting a particularly massive Great Jagras. The Great Jagras is normally a bit of a pushover in Monster Hunter: World, but this one is a significantly tougher customer. Completing the quest will earn you a couple of Faux Ticket III items, which you can use to unlock two new delivery quests for some cool layered armor pieces. The big Great Jagras in the quest will also drop decorations whenever you disgorge whatever he’s been gulping up out in the Ancient Forest, so if you’re looking for specific gems to slot into your gear, this is a great opportunity for that. Arekkz Gaming has a complete run-down on the quests you should be looking to complete during the Appreciation Festival – remember, during each event, you’ll have access to the special quests associated with previous festivals, so if you’re still needing to finish that Dante set, now’s the time to do it. Monster Hunter: World was one of our favorite games of last year, and one of the reasons for that is how it’s been remarkably generous with content. With regular festivals shaking things up and adding new gear every couple months, we’re sure to have plenty to do until the expansion, Iceborne, comes out.